Buckle up. It’s a new month, and that means that we’ve got a whole bunch of new books arriving in bookstores to get excited for. 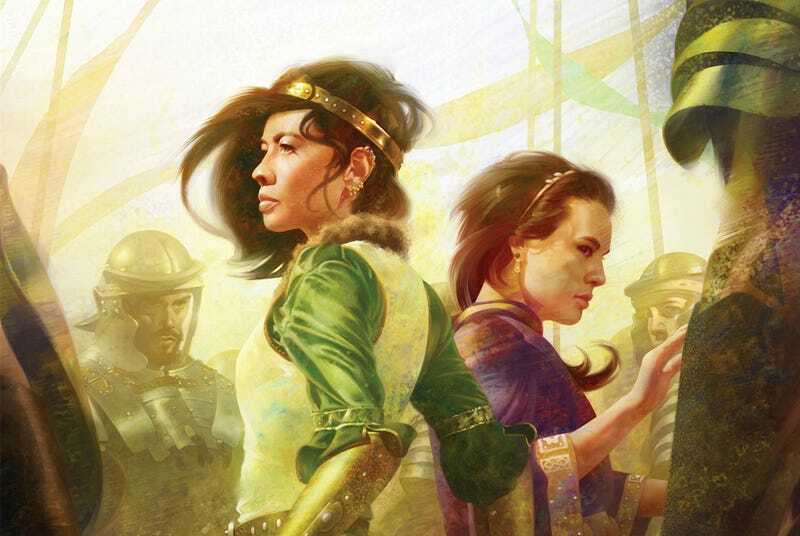 There are new books from Fran Wilde, Guy Gavriel Kay, and Joe Hill, as well as some debuts from the likes of Ada Palmer, Kat Howard, and Todd Lockwood, and more. After The Force Awakens hit theaters, we began to understand just how big the rebooted world would be, and the next major novel, Bloodline, looks like it’ll tell us all about Leia and her relationship with the New Republic. Plus, Episode VIII director Rian Johnson had some input in the novel as well, which makes us interested in taking a look. If Todd Lockwood’s name doesn’t sound familiar, you’ve probably seen his artwork. His art frequently depicts dragons, and now, he’s written a novel, the first in a series about Maia, who raises dragons for the government. When a rare high dragon appears, it upends her life, and she’ll put her life at risk to learn how to ride one. Dragons are always fun, and this looks like a promising start for Lockwood. Special Forces Captain Lincoln Suh found himself dead, then assigned to the 519th Applied Intelligence Group (Outriders), and sent on a mission to take care of a woman who had died. She’s now back, and has plans that could threaten everything that they’ve worked for. Posey has written some interesting novels and short fiction (disclaimer—I published a short story of his in my anthology, War Stories: New Military Science Fiction), and I’m really interested to see what he does with this book and the series that will follow. London is divided after a civil war, leaving the rich separated from the poor. An orphan named Simon travels to London to find someone, and is taken in by a new family, led by a charismatic leader named lucien. Originally published in the UK last year, it was a finalist for the Man Brooker award. Fran Wilde really impressed everyone with her debut novel Updraft (and earned a Nebula nomination for it), but her next book is a novella from Tor’s new Tor.com imprint. In this story, a long-sheltered valley is invaded after a betrayal. Protected by powerful gemstones, Jewel Lin flees, and works to master the valley’s most dangerous gemstone in order to save her home. We wrote earlier this week about Guy Gavriel Kay’s secret weapon for writing fantasy, and because of that, we’re really intrigued by his upcoming novel, Children of Earth and Sky, set in an alternate 16th century Europe under threat from their version of the Ottoman Empire. With this as a backdrop, a young woman looks to extract revenge for her lost family, while an artist sets out to paint the Grand Khalif. Each find one another onboard a trading ship sent out by the city state of Seressa, and their journeys will intertwine. Set in a distant, utopian future, convicts are sent to wander the world to make themselves useful, while sensayers fill the spiritual role of religion in a world where it’s banned. Sensayer Carlyle Foster encounters a gifted child and a convict—Mycroft Canner —serving the family, and discovers that the child’s existence can threaten the entire world. Set in the distant future at the base of a space hub, Central Station, Boris Chong returns home to Tel Aviv to find that everything has changed as realities clash between the digital and real worlds. Publisher’s Weekly gave this book a starred review, noting that “Tidhar magnificently blends literary and speculative elements in this streetwise mosaic novel set under the towering titular spaceport.” We’ve really loved some of his earlier novels, and we’re looking forward to this one. We’ve already reviewed Madeline Ashby’s latest novel, Company Town, and we like what we’ve read. In this future, everyone is enhanced in some way, except for Hwa, one of the few remaining humans without any sort of cybernetic attachments. The Minerva Sierra Challenge is the cybernetic equivalent of the Tour de France, where athletes push themselves to the limit. Marmeg Guinto is one such entrant that has worked her way up from nothing, putting herself together with whatever she can find for parts. The MSC is her shot at getting a new life for herself, even if she’ll risk everything to win. A mysterious affliction called Dragonscale is spreading across the world, causing its victims to spontaneously combust. Harper Grayson, is a nurse treating the infected, and finds that she’s been infected. When her husband abandons her, she begins seeking out a mysterious stranger who seems to have controlled the illness. We’ve been anticipating this book since we first got a glimpse of it last year, and we can’t wait to see what Hill does with his latest thriller. We’ve been impressed with Kat Howard’s short fiction for a while now, and in her debut novel, Imogen and her sister Marin have escaped from their mother by attending a post-grad arts program, where they discover that they might be living in a fairy tale, and that’s a dangerous proposition. The first in a new fantasy series, Ian Irvin’s The Summon Stone follows Sulien, a girl with untold gifts, and who attracts the attention of the Merdrun, a band of warriors that has wrecked havoc for millennia. We certainly dig epic fantasy, and this looks to be the promising start to an interesting series. Just a couple of decades in the future, the US suffering from the affects of climate change. California has found a way to survive by installing an oppressive surveillance state to preserve what resources remain. When a congresswoman is assassinated after supporting California’s secession movement, a civilian, Nathan Fisher, is caught up in the aftermath. Hope Arden is a sixteen year old who realizes that everyone around her begins to forget that she exists: her family, friends and classmates. It sets her up as the perfect criminal. Claire North has gained considerable acclaim for her earlier novel, The First Fifteen Lives of Harry August, and we’re interested to see what she does with this story. We’ve been itching for some new space opera to dig into, and Mike Brooks’ debut Dark Run looks like it’ll be exactly what we’ve been looking for. Far in the future, the Keiko is a smuggler ship that will take on any job, no matter how dangerous. Captain Ichabod Drift knows that he’s being blackmailed to deliver a cargo to Earth, and it could be their last trip. Justin Cronin’s Passage trilogy has been a major hit, and it’s finally coming to a close with The City of Mirrors. Following the destruction of The Twelve, the survivors begin working to rebuild their world. Little do they know that the first of the Twelve is still out there, who threatens to destroy everything that they’ve worked for by killing Amy, humanity’s only hope. Sources: ISFDB, B&N, Locus, Amazon and publishers catalogs.